He was such a great general that two disastrous terms as president did little to dim his star. 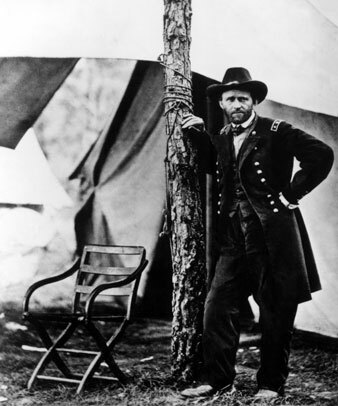 The career of Ulysses S. Grant has been in every way so closely identified with the history of the country for nearly five-and-twenty years that no citizen of the United States, no intelligent citizen of the civilized world, will hear of his death with indifference. His great military services are so universally appreciated by his countrymen that he has become, by a natural and beautiful operation of popular faith, the very embodiment of the idea of successful assertion of the national unity against disunion. The popular instinct is right in assuming that great achievements imply great character. The popular faith which sprang from Grant’s first great success at Fort Donelson became stronger from day to day, until the confidence of a whole nation in the national existence centred in and hung upon the unfaltering faith, the unbending will, and the undismayed courage of one quiet man “fighting it out” on the line of the Potomac and the James not only through the summer of 1864, but the autumn and the following winter too. As President of the United States he disappointed and grieved a large part of the best element of his fellow-citizens; but the memory of the war-time was so strong and deep that they were ready with-excuses for his political mistakes and condonation for his political faults. To them he remained the General, and their sincere and even tender respect made them seek to ignore everything which displeased them, and to prove, by a spontaneous and disinterested impulse of generous gratitude, how far from true it is that republics are ungrateful. The best tribute we can pay his memory is to be as sincere and direct in trying to estimate him as he was In his effort to bring our great struggle to a successful end. The wish to understand him, to know his strength and his weakness, the inward springs of his successes and his failures, will far outlast our time. It will be an historical problem which will be studied in generations to come. He already belongs to history. His early youth was spent in the severe discipline of comparative poverty in a new country. When he was appointed a cadet at the Military Academy, the law required no preparation beyond what the education of the common school of the country district would give, and it is probable that he had no more. He was not specially gifted as a student. It was the physical rather than the intellectual life of the army which attracted him. In physical accomplishments, especially in horsemanship, he soon became noted. In his studies he never reached the medium line of his class. Quiet, resolute, undemonstrative, shy, singularly lacking in ordinary conversational power, he yet had strong common sense and practical judgment, and toward his intimates was kind and considerate. His early army life, though including honorable service in the Mexican war, was not satisfactory to him, and it was at one time widely believed that he had ruined his career by fixed habits of intemperance. He resigned from the army under this cloud, to go through several years of depression, of want, of disappointment, and of neglect. His ventures in private business did not prosper; he had little talent that way. Among his old army acquaintances, and particularly in the staff corps, the impression was prevalent that his life was hopelessly wrecked. The events of the earlier part of his new military career can only be understood by frankly facing this fact. The distrust of him which was manifested in powerful quarters was traceable directly to this. He had to reconquer confidence, a much sorer task than to win it for the first time. – The influence of that period of suffering went even further. It probably exaggerated, in his judgment, the disadvantages of poverty and the value of wealth, and increased a natural paternal shrinking from the thought that his family, should ever he in danger of repeating his experiences. At forty years of age, the outbreak of the civil war so plainly opened anew to him the gates of hope that we cannot doubt his whole nature was roused to a new assertion of itself, and his invincible will was set on regaining at least what he had lost. His patriotic zeal was a thing he held in common with Logan, with MoClernand, with Oglesby, with Palmer, and his other early comrades from Illinois; his terrible resolution, his calm judgment in peril, his strong grasp of great forces were all his own. The unhappy retrospect made the determination to date a new career from that time far more than ordinary resolves even of resolute men. It was for life or death. Nor was the self-discipline he aimed at gained at a bound. As to his habits, it was a gradual conquest, which perhaps showed more plainly the quality of his nerve than any other fact in his history. A defeat was only a signal for a more stubborn effort. Appointed Colonel of an Illinois regiment, he proved useful to Governor Yates in the organization of the contingent from that State, and was appointeda Brigadier-General of volunteers before be had seen any active field service. He then reported to Fremont, and was assigned to a brigade with headquarters at Cairo. He was not averse, in later life, to telling, with dashes of real humor, his experience in trying to break through the barrier of the wonderful and polyglot staff about the St. Louis headquarters, and of his failure to secure a personal interview with the Commandant of the Department. But he showed even then the faculty of taking his rebuffs with patience, and continuing to do with steady energy the work that was at hand. The affair at Belmont showed him equal to a “stand-up” fight, and capable of withdrawing a command from a dangerous position with credit. With the assignment of Haileok and Buell to the two principal departments of the West, the systematic prosecution of the war there may be said to have begun. For the first time the forces were somewhat commensurate to the work, and Sherman’s estimates, which had seemed so absurd to Cameron, were found by Stanton not to be unreasonable. Halleck saw that the Tennessee River was the line by which to break the Confederate’ centre, and was glad to make use of Grant’s eagerness to make an expedition against Forts Henry and Donelson, and thus to take the initiative in tbe campaign from Buell, who was methodically perfecting his arrangements for an advance. The audacity of the movement suited Grant’s qualities as a soldier, and was Itself in no small measure the cause of its success. Fort Henry’s capture was, as to the fighting, a naval engagement; but the surrender of Donelson remains a strtking proof of the moral effect of a daring initiative. Grant’s confidence seemed to the Confederate generals to indicate an army at his back double what it really was, and they took him at his word when his demand for “unconditional surrender” implied an overwhelming force to execute his threat. This really important victory came at a time (February, 1862) when the fame it gave was multiplied in public estimation by the universal impatience at the delay in opening the campaign on the Potomac, and Grant reaped the full benefit of it in glory and in promotion. He was immediately made to feel, however, that his military superiors were predisposed to unfriendly views of his conduct. Halleck based severe reflections on his conduct after the battle upon some irregularities, which were reported, among the troops at Donelson, and upon what seem to have been accidental interruptions of mail and telegraphic communications between them. With a want of frankness, Hailsek represented complaints as originating at Washington which were merely the echo of his own despatches sent to McClellan. Grant interpreted these things as evidence that in old army circles the past was to be inexorably remembered against him; and when he was, ordered to turn over the command of his active column to General C. F. Smith and remain himself at Fort Henry, he felt driven to ask to be relieved from service in Halleck’s department. But this victory had given him a popular strength which enabled such friends at Washington as Elihu Washburne to counteract these hostilities, and Halleck felt obliged to be contented with Grant’s very brief explanations and to restore him to command. The battle of Shilob followed quickly (April 6, 7, 1862), and the result tended to intensify the debate whether military good conduct or the blind favors of fortune were to be thanked for his success. That the two-days’ battle had ended in a national victory no one denied, but there was a loud outcry that Grant’s own army had been routed when Buell’s arrival on the field turned disaster into victory. Halleck himself took the field, and, by announcing Grant as second in command without immediate control of troops, practically retired him. Grant never forgave this, and would again have insisted upon being relieved of service in that department if Sherman, with warm friendliness, had not urged patience and the awaiting of the varying chances of the campaign. It was, no doubt, true that Grant had been over-confident before the battle of Shiloh, and had believed that the enemy, who had just made the retreat from central Kentucky to Corinth in Mississippi, would not dare take the offensive against the victorious divisions he had brought from Donelson. His troops did not encamp upon a continuous or intrenched line; but were echeloned in separate camps by divisions. The enemy’s advance was covered by the forest, and Grant was practically without cavalry to give him information. When, then, his divisions were attacked, though each was able to form in front of its own camp, each in turn was outflanked and driven back before the necessary manoeuvres could be made to bring them into united action. Such was the situation when Grant reached the field, and it was with great difficulty that the successful advance of the Confederates was checked after a most bitter fight, which had lasted the whole day. That Grant himself was undismayed was shown by his making immediate dispositions to resume the offensive when Buell’s troops arrived, and by his delivering the return blow early the next day with restless effect. His patient endurance of his half disgrace brought its reward. Halleck would seem to have gained confidence in him and to have had his pre judices removed; for when he became General-in-Chief he gave Grant most earnest support in the Vicksburg campaign, and served loyally under him when the latter became Lieutenant-General. The campaign of Vicksburg at first seemed fated to keep open the question of Grant’s capacity, though there was now no question of his fighting qualities. His abandonment of the inland route for that of the Mississippi River cannot be defended on military principles; and intrigues connected with the assignment of McClernand to an independent command had probably more to do with it than any distinctly military reasons. But when he finally broke loose from the trammels in which he had placed himself, and, crossing the Mississippi again at Bruinshurg, divided and beat in detail the enemy’s forces, then, turning upon Pemberton, drove him into Viksburg, and invested him there, resuming his own communications in doing so, the most sceptical were forced to admit his possession of military talents of the highest order. Penberton’s surrender on the 4th of July, 1863, came with the victory at Gettysburg to give assurance that a permanent turn in the tide of war had been reached. Grant’s fame was now secure and his military preëminence was scarcely disputable; but when in November of that year he redeemed the disaster of Chickamauga by the dramatic victory of Mission Ridge, his promotion to the Lieutenant-Generalship may he said to have been made by acclamation. If the hard hammering of the Virginia campaign which followed had little of the brilliancy of his former exploits, it perhaps consolidated all the more his reputation for tenacity, and for power to infuse his own unconquerable determination into a great army. If we shuddered at the fearful cost of life at which that campaign was carried on, the steadily defensive policy of an army which had made the dashing campaigns Lee had before that time conducted, was sufficient proof of the conviction he felt of Grant’s ability to deliver a fatal thrust if the guard should for a moment be lowered. The surrender at Appomattox was made more imposing by the unaffected modesty of the victor, and the nation’s gratitude was intensified by the perfect subordination to the civil authorities of his country, which removed every fear that the war had raised up any soldiers too proud ortoo powerful to be peaceful citizens. His personal bearing had been in thorough keeping with the modesty of his public utterances. He was never violent or abusive. He was scrupulously courteous to the humblest, and never allowed arrogance or profanity about him. To his faithful subordinates he showed himself a faithful friend, and never grudged to these the opportunity to reap their full share of glory. To those whom be suspected of covert enmity or intrigue he was implacable, though undemonstrative, and to all such he effectually barred the way to important commands. In both likes and dislikes he was sometimes wrong, but the virtue of close sticking to his friends was so popular a one that the abuses of it were easily forgiven. No man of the century had a juster claim to he called happy, few had so just a claim to be called great when the civil war closed. When be was elected President he had evidently formed the purpose to conduct his Administration with independence, confining the executive departments to the proper discharge of their public business, and resisting the temptation to use the appointing power to increase the Presidential influence over Congress. His first choice ot Cabinet officers was made without listening to managing politicians, and was a sincere effort to apply business principles to his work, even in the case of those appointments which were most criticised—Mr. Stewart’s to the Treasury and Mr. Boric’s to the Navy Department—it was plain that he had used his own judgment, and had concluded that those departments could be well administered by business men who had made a success of great do-mestic and foreign commercial transactions. The discovery that Mr. Stewart was ineligible by law was a disappointment to him. He was now subjected to the ordinary political pressure which tests the administrative principles of a President in office, end the appointment of Mr. Boutwell was received by all friends of reform as discouraging evidence that his predilection in favor of business principles in administration was no deep and decided conviction. In yielding to those who claimed to be party leaders in Congress, he went at one step the whole length of filling the most important and most distinctively business place in the Administration by a typical political appointment. It soon became apparent, also, that it was his misfortune to have no standard of fitness for civil employment, such as actual service under his own eye had given him for military office. As he had himself been advanced to the highest civil duties without special training in affairs, he was modestly inclined to assume that other important positions could be creditably filled by men who lacked both experience and learning. His natural reticence made it difficult even for those who were his proper advisers to hold with him the free conversational conferences which are the soul of administrative coöperation. His military habits led him to think it was for the Executive to decide, and for all other administrative officers simply to obey. He was ready to leave a large latitude to subordinates upon condition that they should uncomplainingly accept his will when, even without conference with them, other influences had persuaded him to give direction to any special matter. His love of discipline made him listen favorably to the arguments of the” Machine,” who likened party organization to that of an army, and preached unquestioning obedience to the word of command as a merit in a party man as in a soldier. It is easy to see how mischiefs would flow from such a habit of mind. In the absence of fall discussion and conference with the great officers of State, irregular influences were pretty sure to have undue weight, and “kitchen cabinets” were pretty sure to be formed. The President would be committed to some wrong purpose or mistaken conclusion before those with whom he should have consulted were aware of it, and even if he were convinced of the necessity of reconsidering; the ungracious task of presenting objections against a declared intention gradually produced irritation. For a year, however, these things were annoyances to those immediately concerned, rather than matters of serious moment, though they impressed with vague fears all who became aware of them and who earnestly desired that the best tendencies in the Republican party should prevail. Then came the negotiations of the San Domingo treaty, one of the most astounding events which ever occurred in the history of a constitutional government. The constitutional power of annexation by treaty has been as gravely questioned as any which the national Government has ever exercised, and even among those who regard it as settled by precedent, it is felt that, no public act should be more carefully guarded by all the forms of diplomacy and all the checks of public Congressional discussion. But General Babcock,tbe President’s aide-de-camp, sent ostensibly to make an engineer’s reconnoissance of a bay recommended by naval officers as a coaling station brought back a treaty for the cession and annexation of the domain of a foreign nation, and the incorporation of such foreign people into our own nationality. This treaty he had negotiated not only without authority of law, but without the authority, consent, or knowledge of the State Department of the United States or of the Cabinet. That the motive was the enriching of a ring of private persons upon concessions from the then Government of San Domingo, was more than suspected. What might have passed as an absurd if not insane usurpation of power by a subordinate officer, became a source of public danger when the President adopted the act of his aide, directed the treaty to be pro forma signed by a consular agent, submitted it to the Senate, and entered personally into a vigorous effort to secure its ratification. The decline and fall of the Republican party properly dates from that event, though the consequences were delayed and other things added td the downward impetus. Mr. Sumner was Chairman of the Committee on Foreign Relations in the Senate, and so earnestly opposed the treaty, both upon the principle contained in it and upon the methods of procuring it, that a permanent breach between him and the President was made. It was believed by well-informed persons that Mr. Fish had sought to retire from the Secretaryship of State, but had yielded to the insistence of the President, and to a general wish of his party friends that he should not abandon the direction of our foreign affairs at so critical a time; for the Geneva arbitration, the Cuban insurrection, and other matters were making our relations to foreign Powers very delicate. But by remaining in office, even upon the most binding pledge that no further interference with the duties of his department should be permitted, he was still obliged to assume the ex-postfacto responsibility for the treaty. Mr. Sumner believed he had the most distinct assurances during Babcock’s absence that no treaty of annexation was dreamed of, and so far as the Government was concerned, such assurances could have been given with the sincerest honesty; but when the Secretary was induced, from a sense of public duty, to accept the burden of the treaty, his month was closed so that be could not explain his own previous relations to it, and Mr. Sumner, thinking he had been deceived, broke the long and cordial friendship which had existed between them. Mr. Schurz shared the objections of Mr. Sumner to the treaty, and was equally startled by what they suspected of the unconstitutional method of negotiating it. The two Senators made vigorous and uncompromising war upon the project, and the treaty was defeated, but not till other political evils had resulted. In the effort to procure votes for its ratification the President was brought into unwontedly close contact with the most demoralized and demoralizing element in his party—the “carpet-bag” politicians of the South. Intimating that they could ill afford to antagonize the influence of Mr. Sumner among the freedmen, they still held out promises of assistance if their wishes in other respects might be regarded. They wished the removal of the Attorney-General and the substitution of a Southern Republican. Mr. Hoar was summarily dismissed, the manner of it being as far removed from the custom of civilized governments in that respect as was the original negotiation of the treaty. The opportunity was well improved by the leaders of the Republican “Machine.” They adopted the habit of appearing before the President and urging their views in the form of earnest harangues, neither asking nor expecting immediate response, but content to await the effect of reiterated assertion upon his mind. His unwillingness to yield his own purpose made him quick to see the advantages of coöperation, his singular reticence deprived him in the main of the suggestions or criticisms of his constitutional advisers, the absence of well-defined convictions as to public policy made him more easily yield to the methods of such a coalition, and before the midsummer recess was reached he was practically “solid” with Conkling and Chandler. Mr. Motley was next recalled from England as a punishment of his friend Mr. Sumner, upon pretexts so flimsy as only to make more demonstrably evident the fact that it was done without just cause. It was done against the general sentiment of the Republican party and against the most earnest protest of many of the first men of the land “outside of politics.” Before Congress met again in December there had been a practical reconstruction of the Administration. Belknap was now in the War Department, Robeson in that of the Navy, and Delano in the Interior. The power of Babcock and his associates near the person of the President was not diminished, and if they had been warned off the domain of the State Department, their activity and their malign influence were chronicled in the quick succession of scandals concerning the bonded warehouses, the sales of public lands, the army tradership contracts, the naval contracts, and the whiskey frauds. The public, with a generosity born of true gratitude, refused to connect the personal character of the President with the notorious profligacy in office which could not be concealed; yet a respectable portion of his party refused to support him for a second term, and a convention met at Cincinnati to nominate an independent candidate. The loose organization of a mass convention gave the opportunity for its capture by a few expert “workers,” and the absurdity of the Greeley nomination made the reëlection of Grant a foregone conclusion. The despotic control of the party by the “Machine” leaders, the charitable hope of hosts of grateful citizens that there would be a reform within the Administration, and the distrust of the Democratic party, combined to make victory easy. The hoped-for reform did not come. The President refused to believe evil of his personal friends and dependents; his tenacity of purpose and of affection was successfully appealed to to prevent his abandoning them “under fire,” and the scandals only grew in number and in proportions. The appointment of Mr. Bristow to the Treasury Department was, however, accepted as proof that thorough work was meant with the suspected irregularities there. When prosecutions were begun, and Babcock was indicted, the President’s words, “Let no guilty man escape,” were again hailed with delight by all who wished well to the country. Yet Babcock was not convicted, and the Secretary found his position intolerable. The managers of the whiskey ring had the effrontery to claim that they levied their assessments upon distillers and cheated the Treasury to raise a fund to insure a third term to the President, and that the end justified the means. When some of them were convicted and sent to the penitentiary, they even alleged an understanding that they were to be pardoned out. The injury done the President by these things was undoubtedly great, but the willingness, nay, the eager desire; of the nation to interpret all things consistently with the honor ot their hero, was a better protection to him than the most skillful arguments of party advocates. They believed that he had been abused by these who owed everything to him, and that his own purposes had remained as pure and as patriotic as when he was conducting the weary campaign of the Wilderness. The second term closed with a pervading opinion, nevertheless, that his power to discriminate character was not such as is needed in one to whom hundreds of thousands of appointments are intrusted, and that the country must find some way of requiting his military services that should place a third term of the Presidency beyond expectation or faintest hope. In our foreign relations, when once the San Domingo scandal had passed by, there was nothing to regret. Our attitude toward the Cuban insurrection was that of dignity and steady repression of filibustering. The Geneva arbitration was skilfully end happily conducted to an end. Fenianism was squelched when it took the form of invasion, and if the representatives of the nation abroad were not always such as should have been chosen, a careful supervision of their official acts prevented mischievous consequences. The public debt was greatly reduced, and the material prosperity of the country was marvelously increased. General Grant’s tour of the world fter he became again a private citizen filled to the full the wildest imagination of the people as to the place to which the nation had grown in the world’s estimation, and as to the connection of it all with the triumphant conclusion of the civil war and with the really great qualities of the man who had conducted our armies. Many things in his career had given them sorrow, but the strong impulse of a grateful people has been to attribute to himself the deeds which have given him and the country imperishable glory, and to lay at the door of others or to impute to amiable weaknesses the things that have diminished his fame. With heartfelt earnestness the American people unite in the prayer, May he rest in peace!